I used to wander past this billboard on my way to the China Daily office, back when I used to work for the paper. 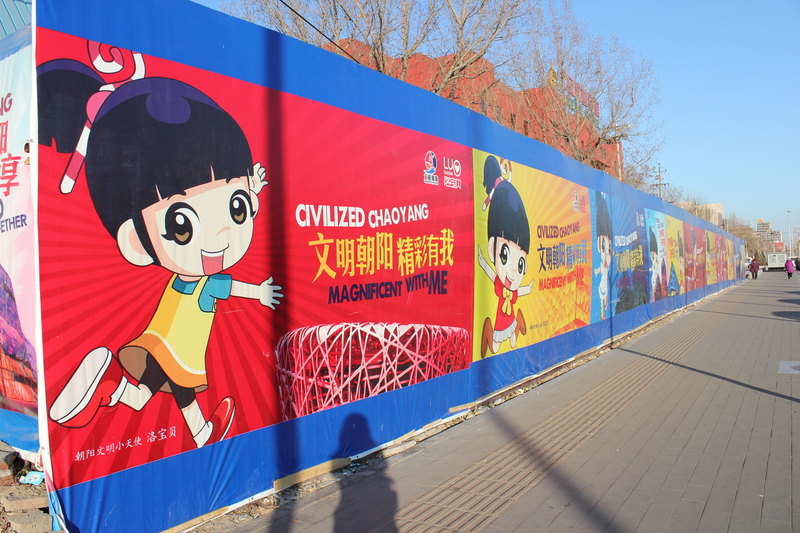 These bill boards were part of a scheme to promote how “civilised” and “magnificent” the Chaoyang district of Beijing is – which leads one to ask, ‘What was it before?’ and ‘What about the other districts in Beijing?’. Imagine walking around London and coming across large “Civilised Brixton” or “Civilised Chelsea” billboards. Many English-speaking expats were amused by the English translation of 文明朝阳，精彩有我 wenming chaoyang, jingcai you wo, into the clumsy, ‘Civilised Chaoyang, magnificent with me!’ spewed out by the Government translators. The idea behind the motto was that Chaoyang is super classy and exciting, and we’re all part of that. It just didn’t come across in the English translation so well. I’m pretty sure one ride on the Beijing subway is enough to assure you that Beijing cannot be classed as ‘civilized’. Oh yeah, I used to take the subway from Dongzhimen to Xizhimen, then hop on a bus. It was always the most uncivilised hour of my day.